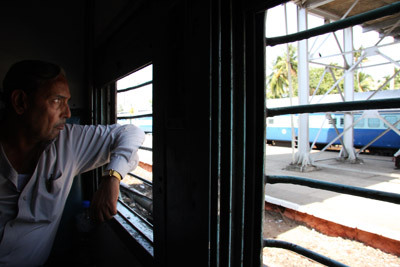 With our experiences on the Indian trains in Kerala and Rajasthan behind us, we weren’t looking forward to another train ride. After a couple hours of online research over an internet connection that puts my patience to the test, we discover that it will be many thousands of rupees to fly to Bangalore. We decide we can’t possibly afford the flight, which leaves us only one option; the train. We search a little deeper and find that the flight from Delhi to Bangalore is reasonably priced, but flights out of Varanasi are overpriced. We rationalize that any option saving us from a 57 hour train and the Varanasi airport can’t be all bad. In my stomach, I could feel we were embarking on an adventure. In hindsight, that feeling in my stomach was really something else. We request that our hotel staff goes to the train station to buy our tickets for us, which saved us hours of painful waiting time. We had bought tickets for the highest available class on this train, which was 2AC, offering larger beds, heavy air conditioning and navy curtains which partially blocks people from peaking in. 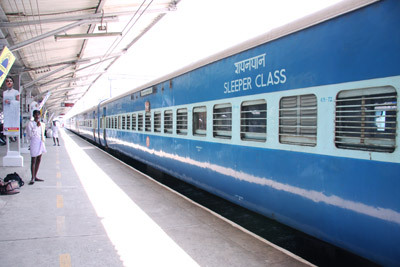 The ticket was more than four times the price of the lowest class, the sleeper class, but we knew it would be worth the money. We methodically packed all our belongings, including our new Varanasi bamboo flute which we bought because the merchant was a creative comedian. I ripped up the room to make sure we hadn’t missed anything, and dragged our bags down to the baggage room, before we checked out of the hotel. Tina had her heart set on the marinara pasta at Pizza Hut, so we walked to the shopping mall down the street and ordered takeout. I went to McDonalds for a savory and healthy McVeggie burger and an ice cream sundae. We left the shopping mall to find our Sarnath taxi driver lined up outside, and he had not forgotten us. “You pay four hundred rupees for extra restaurant, then for Pizza Hut. Cost more.” Incomprehensible that this man thinks he can make me feel guilty for paying his agreed price. “Four hundred rupees was the price you agreed on. That is what it was worth and I paid.” As we took off in a cycle rickshaw, the taxi driver continued to fumed in a much quieter manner. I respect the Indians for being consistently persistent, even if I don’t agree with their tactics. Train station lobbies turns into public hotels at night time. We passed the price-fixing congregation of rickshaws outside the hotel, and found a reasonable negotiator out on the main road. He got us to the train station, but not before demanding more money. We weaved our way through the fields of rolling corpses in the station hall and found our way to the Varanasi to Delhi platform. The first platform we were directed to was the wrong one, which we only find out after Tina does some more probing of the station officials. We heave our bodies up the overhead walkway to cross the railway tracks to the final platform. We descend into an open mausoleum. Bodies are strewn over every inch marble, lying awkwardly and appearing only half alive with no movement like a terrible war had just stripped the life of hundreds of men, women and children. Tina spots a small patch of ground space just beside the tracks further up the platform. We claim the spot and take a seat while we wait for the train. As we waited, I peered across the tracks and through the chain linked fence to a shack that was barely standing but still inhabited. A family was outside sharing a meal of rice, and I couldn’t help but feel for what appeared to be a very difficult life. I looked to Tina to say “How could they possibly live with trains passing them all day and night, only meters away?” I knew the answer as soon as the words left my mouth. They literally had nothing except each other, and yet they were smiling. Tina and I had a bet that the train would not have a restaurant or kitchen car. I had seen the restaurant cars in Europe and didn’t think there was any possibility that the Indian trains would have anything similar. The other trains we’ve been on had no sign of a kitchen, only sellers rounding the carts offering chai, soup, samosas and common Indian snacks. As soon as we found our seats, Tina couldn’t wait to search the train for the kitchen car. “I win! I win! The kitchen car is three cars to the right. They have pots on the stove and a menu that’s surprisingly cheap.” I couldn’t believe it. I went to get us a cup of tomato soup to prove it. It wasn’t much longer before my stomach was telling me I had lost more than I had bet. I had to cut our game of euchre short, which frustrated Tina who had managed to beat me consistently in a game I had just taught her how to play. I ran to the bathroom, and stuck my head down towards the metal hole in the floor. The wind flying up through the Indian toilet wasn’t enough to keep the bathroom smelling rank. I definitely didn’t leave it smelling any fresher. It was a long night. Tina and I tried to rest curled up on a bed that is too small for me. today (without much change it seem) since India’s independence in 1947. We finally arrive at Delhi’s Paharganj railway station, and my stomach couldn’t thank me more. I felt like I was about to drop a lung and can’t do enough to rush to the only toilet in the area; a paid toilet with a long lineup. I push my way through the line and reach the ceramic hole in the ground just in time. We booked a taxi the night before, and fought with the driver to come find us at the right gate into the station. Ironically, the driver was the same man who drove us to Agra, and scammed us by using the air conditioner, just a few weeks ago. We had only a few hours before our flight and headed off to spend it with Puneet and his family. We talked, ate exquisite sandwiches and recovered from the uncomfortable train ride. Puneet warned me that even he does not eat the food on the train. His family is always very careful to bring their own food before they embark on any excursions. “You do not know where that food is coming from or how they make it. Everybody know food on train is not good for you.” I certainly learned my lesson. Yet again, Tina was surprisingly healthy despite having consumed more than I. It was long before we were off to the airport to catch our very budget SpiceJet flight to Bangalore. Arriving in Bangalore, the sky was pouring and we were forced to pull out our rain jackets for the first time. Our hotel was one of the cleaner place we stayed the entire trip, as the staff was clearly catering to business professionals. Newspapers were brought to our door every morning and they had a lounge area connecting the rooms. We arranged a meeting for dinner, took a desperately needed shower and nap. Dinner at Puneet’s house was waiting when we arrived. They are the best! Tina had a couple friends in Bangalore who were very anxious to meet us. We invited them to the hotel restaurant, and I was quite glad we did. It was really amazing to get to know the brothers, who own a real estate development company in Bangalore. “We usually just go to Subway.”, they responded when asked about their favorite restaurant. I was completely taken aback as the dinner conversation was very reminiscent of home. Topics include business management, the internet and personal development. We ended the night by getting a picture together on a Blackberry. When we woke up the next morning, we had only twenty four hours to explore Bangalore, get ourselves to Chennai and get to the airport for our flight to the Andaman Islands. We rented a car, and had the driver take us directly to the train station. We needed train tickets and we had no time to waste. Unfortunately, the staff at the train station had another idea for us. There weren’t many people in the station, but no agent would serve unless we were in the Foreigner and Special Assistance queue. This counter was intended for seniors and people with disabilities, and included a ramp to roll wheelchairs up to the window. Even the empty women’s line wouldn’t serve us and redirected us back to the Foreigner sign. This counter was also the only unmanned station, excused by a note from the agent stating she was on a break. I got my first taste of Bangalore civility from the man sitting in a row of chairs beside the window. He had been there before us, mostly ignoring our frantic Indian attempts at locking up the space in front of the window. Occasionally, we would passively mention “There is a queue here. You are next chair.” After a while I could help but follow his advice because he was being so honest and civil in his manner. We wasted more than an hour in line, until the agent finally showed up and sold us two seats in the chair car at four in the afternoon. I had only one place to visit in Bangalore, and it was Electronic City. Known as the Indian Silicon Valley, I could only help but be curious about what it was really like in the bustling tech capital of Bangalore. Electronic City is about an hour drive outside of downtown Bangalore, and definitely cured my curiosity and skepticism of Indian technology business. The Infosys campus is grand to be sure, a Microsoft style compound surrounded by thick stone walls and cameras. Nothing was more of a contrast in India than here, were the walls literally separated the chaos of life in India with a Californian utopia of lush greens and clear glass structures. Even the flying dust of construction and garbage seemed to disappear at the wall leaving only fresh blue skies. Despite our best efforts to break the security at the main office, we were unable to get ourselves onto the campus, but I had seen enough to satisfy the nagging questions in my head. It really does exist, it really is grand, and it is obvious why outsourced technology jobs are so prestigious and competitive in India. Being employed at one of the multinationals in Bangalore, Chennai, Mysore or Hyderabad, is really the really the difference between a comfortable life and a challenging one. Once you are welcomed onto that campus, you are welcomed into a different world within India. After being rejected at Infosys, we rolled around the rest of Electronic City before heading to the shopping mall to fuel up before our train ride. The shopping mall was at least as western as everything else in Bangalore. It was the largest mall in the city, but could have been a medium sized mall in Seattle. We found everything we needed in the food court, as well as sunscreen in three different stores. Indians don’t traditionally use sunscreen, so this should have been a difficult item to find. We grabbed some Pizza Hut takeout and Baskin Robbins ice cream and were on our way. The Bangalore train station was strikingly modern. The underground passageway still smelt overwhemingly of urine, but was quite devoid of people. The platform was well marked and easy to locate. Those waiting for the train were standing with dignity instead of lying on the ground. Even the beggars had the decency not to pester anyone. I felt comfortable for a time. “Why are you making the seat dirty? You would not do that where you are from! You are using the same shoes you use to go to the bathroom! Do you think just because you are in India you do not need to be civil?” I couldn’t believe the gall, the nerve of this man. I get down off the seat I was standing on to put our bags up on the high baggage racks, and turn around. “You know this man cannot sit in his seat now that you made it dirty.” I look around and the train is entirely empty. There are so many empty seats there was no need for them to be assigned. I look down at the seat. There are so many stains on the leather that you couldn’t visibly identify the marks my shoes had made compressing the cushion. I look at the man who is supposedly out of a seat. There are lots of words to explain his appearance, but respect-worthy cleanliness was not one of them. “I live in America, and I know in America people would not do that.” I chose not to rebut the rude grey haired man sitting across the aisle, for his irrational arguments were not coming from a mind willing to listen to reason. Tina was about to blast him, but I just looked at her and we both knew what the best action was. Needless to say, I was more careful of the seats on the way out. The conductor of the Bangalore Chennai train was overtly efficient. He enticed with drinks, snacks and a meal, which Tina thought was a wonderful surprise. She even saved her Pizza Hut pasta to consume the meal she was served. I held my ground. After the sip of soup 24 hours earlier that still resided in my digestive system, I could not take the chance of aggravating it further. Tina was all too happy to scavenge the best bites from my plate. We played a few card games until I decided I needed to return to my strengths and picked up a book. There’s no such thing as a line. 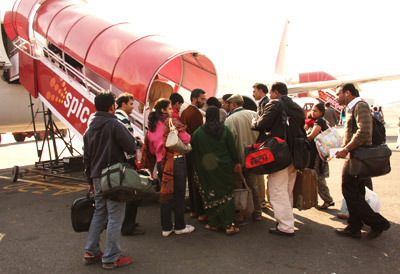 People squeezing on a SpiceJet flight. We arrived in Chennai and made our way to Brian’s flat, a midway from the train station to the airport. It was absolutely fantastic to see our friend from Ladakh again. We had the chance to marvel at his diverse matchbox collection before a good rest on a comfortable bed. Thanks Brian and his wife! We really appreciate your hospitality. It made all the difference in the world, and a fond memory. Tomorrow, we’re off to the Andaman Islands! This entry was posted on Fri, Apr 25, 2008 at 9:31 pm and is filed under India. Email this page. Just saw your blog regarding your visit to India. I live in banglore. Next time whenevr you come to Banglore please be my host. I wish Happy and Prosperous new year to you and your family.